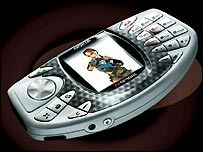 Nokia has been talking up the prospects for its mobile gaming phone, the N-Gage, as it goes on sale. The Finnish handset manufacturer said it was hoping to sell several million copies in the coming year. The N-Gage is designed to compete with Nintendo's GameBoy, which dominates the portable gaming market. Games on mobile phones are expected to be big business, with some estimating that people will be spending more than $3bn annually by the year 2007. The N-Gage goes on sale in more than 30,000 shops globally on Tuesday, at a range of prices. In the US, the phone is expected to cost around $300. In the UK, the mobile operator O2 has been offering the phone for £99 on a monthly contract. The retailer Carphone Warehouse has the phone for between £230 and £275. On the eve of the N-Gage going on sale, Nokia was upbeat about future sales. 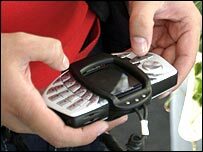 "We are targeting selling several million N-Gage units in 2004," Nokia spokesman Kari Tuutti told the Reuters news agency. "We have had a very promising order intake from the distribution and retail outlets in different countries. It indicates good momentum for N-Gage." The device has more processing power than most phones and can run 3D games such as the popular Lara Croft title, Tomb Raider. But Nokia faces a tough fight against the undisputed portable gaming leader, Nintendo. It has sold 150 million units of its GameBoy since it launched in 1989. The N-Gage can cost at least twice as much as the GameBoy Advance SP and there are fewer games available for it. Nokia will launch with just 10 games, rising up to 20 by Christmas, compared with more than 700 titles for the GameBoy. It has also been criticised for the N-Gage's battery life and the need to take out the battery to change games. And next year, Nokia will face a challenge from Sony which is planning its own handheld games consoles. With the N-Gage, the Finnish handset maker is hoping to capitalise on the predicted growth in mobile gaming. Mobile phones are widely seen as bringing video games to a broader audience such as women. The market in mobile gaming is currently worth around $600m. But it is predicted to rise to almost $4bn in four years' time, with 500 million people playing games on their phones.